He is the soul of Ma'ale-Adumim! He devoted his life to this city which defends Jerusalem as the Israeli capital for eternity. For twenty years, he has been the mayor of this city and his prestige among its 39,000 resident is very high. I am referring to Benny Kashriel. He was offered to be a member of the Knesset many times, but he refused. His preference is to build this city and enlarge its population to 80,000. This city, which was founded by Yitzhak Rabin, is considered by the US State-Department as an Israeli settlement in the West Bank. I decided to visit this wonderful city because I have read, in the American media, about protests against the building of Ma'ale-Adumim, which has many American residents living there. Apparently the press never bothered to do the ABC's of journalism: to get reactions from Mayor Kashriel or from his spokesman, Yechezkel (Hezi) Zissman. I asked Hezi Zissman why he does not ask Ethan Bronner (Jerusalem Bureau Chief, NY Times), for example, to visit Ma'ale Adumim. He told me that there is a danger that the media will write only negative stories about this beautiful city with great housing, great landscaping, and space for new developments and buildings. It is shameful that many of Mayor Kashriel's initiatives never got covered at all. These include the opening of a museum for famous artists such as Moshe Castel, the development of new industry, and cultural activities, including a national center for Ladino culture with its famed director, Dr. Avner Peretz. Instead, the media continues to focus on the necessity for Israel to return to its pre-war 1967 borders because of the international pressures, and non-stop extreme-left propaganda. Zissman took me on a tour of the area. There are Palestinian villages near Ma'ale-Adumim. He pointed out the defense wall that Israel built in the West-Bank. He showed me some of the latest developments of this city including a number of popular restaurants including 'Aroma' and 'Avi Mishor'. Zissman told be, "I was born in the Likud and I will never leave the Likud. 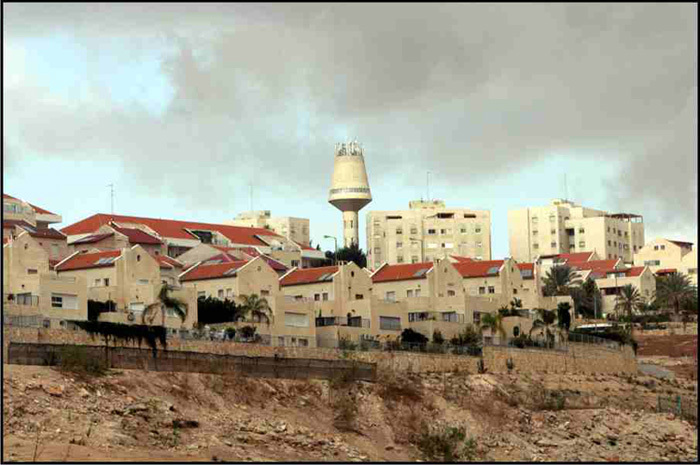 As to the American pressure: Ma'ale-Adumim is in our national consensus. In the past, the American administration viewed us as an integral part of Israel. President Bush was our friend, but President Obama moved away from America's long held responsibility linked to democracy. Yitzhak Rabin decided, in 1975, to establish Ma'ale-Adumim and the city of Ariel. Rabin then added land for expansion. It was strategically an act to defend Jerusalem, Israel's capital. Ma'ale-Adumim had to develop and grow! There were attempts to integrate that city into Jerusalem. Ma'ale-Adumim has lands that Jerusalem does not have. It does not want to be Jerusalem's sister city. It does not have cultural or economic relations with Jerusalem. It does not have religious problems or religious confrontations. Its community is unique and different from Jerusalem. 15% of its population is from English speaking countries. The majority is from the USA. 10% of the population is from Russia, having their synagogue and library. Recently, it absorbed forty new families from the USA. It has a conservative synagogue and center for them." Mayor Kashriel is also proud that his city has 250 factories including high-tech, food, glass, and other enterprises. He explained that the Likud government helps the city to be developed. "I do not want to be in the Knesset. I think that, especially now, when America puts pressure on us, I can personally contribute more as a Mayor to Israel's agenda and survival," said Kashriel. When Kashriel discussed Israel's politics, he said, "We have to understand the geo-political issues. Israeli politics now is wasting too much energy. This is bad for national projects. We have too many political divisions. I am against regional elections because the country is too small. I’m for increasing the minimum percentage parties need in elections which will decrease divisions in the Knesset." When asked if he supports the idea of an Israeli constitution, he said, "It is a good idea because we need to define the structure in which anyone would be able to act based only on devotion to the state of Israel, its Jewish character, and its flag. I support democratic rights for Israeli Arabs, but I am against exploitation of Israeli democracy." Another of his strong beliefs is: "I am against those citizens who call for the elimination of Israel. I am a Likud person. I think that Bibi Netanyahu is a good Prime-Minister and we must help him to stand firm against Obama's pressures on Israel. I call on the Jews in America to fight for Israel and I am against a lobby, such as J-Street, which is damaging Israel's status in the USA because of ignorance or personal interests." Kashriel summed thinks up by saying, very simply, that everyone who wants to express solidarity with Israel and the Israelis should visit Ma'ale-Adumim.